Facebook improved their mobile offering. So now I will play it. Obviously sentiment is not pretty. But now with a fairly slick mobile offering in play, Facebook is positioned for the post PC world, and all its possibilities. Due to its really oversold condition, I will take an initial position. 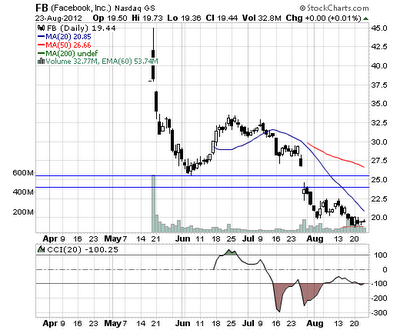 Because its a broken stock with a botched IPO and insiders selling like mad men, Facebook is a show-me story. 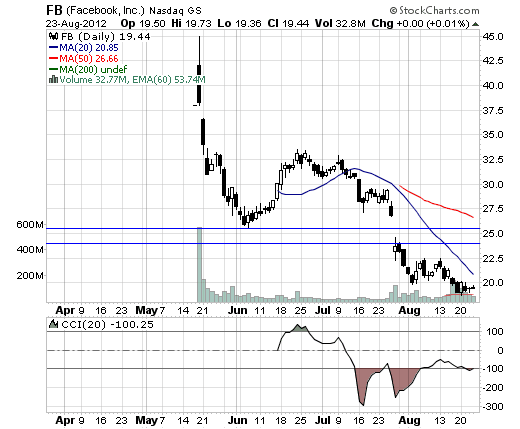 With their adoption of a realistic mobile strategy, I am expecting FB to bottom, but I will be very surprised if there is enough sentiment change to push FB above 24-25 without evidence of financial improvement. Since its IPO, the revenue trajectory is still in tact. A faster, better user interface for mobile will lead to higher mobile ad rates, and should keep the trajectory going.